• Drop-off laundry service offers quick turnaround times and competitive pricing. Drop your dirty clothes off at our Broadway or Winthrop locations and let us do the rest! • Pick-Up and Delivery service makes it extremely easy for busy residents and commercial businesses in the Taunton Area to stay clean. We come to you for only $1.10 / lb with a 10 pound minimum! Call (508) 824-6483 or send us a email to set up your service. Available at our 173 Broadway and 89 Winthrop Street locations. E-Z Clean's laundry attendants wash, dry, and fold your garments for only $1.00 / lb with a 10 pound minimum. When life gets hectic and the laundry never stops, this service is priceless. Our Wash, Dry & Fold service utilizes all the same high tech laundry machinery as our self-service section, featuring the San-O3-tyzer. This state of the art technology results in cleaner clothes and causes less fabric wear and tear than traditional hot water washes, saving energy and keeping your clothes in shape and looking great. 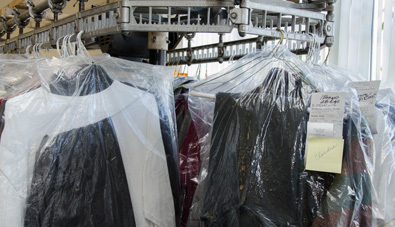 In addition to our wash, dry & fold service, E-Z Clean Laundry offers dry cleaning services at our 173 Broadway and 89 Winthrop Street locations with a 2-3 day turnaround. Perfect for the business person on the go that has suits, slacks, blouses and other delicates that require special handling. Convenience and friendly professional service are paramount when it comes to our drop-off laundry services. Register Your Card & You Could Win! By registering your loyalty card, you will be automatically entered to win our monthly prize of $25 in free credits. Make sure you fill out all of the information in order to qualify for your chance to win. Good luck!